The Ruya Shop is launching a series of small exhibitions by artists predominantly based in Iraq. 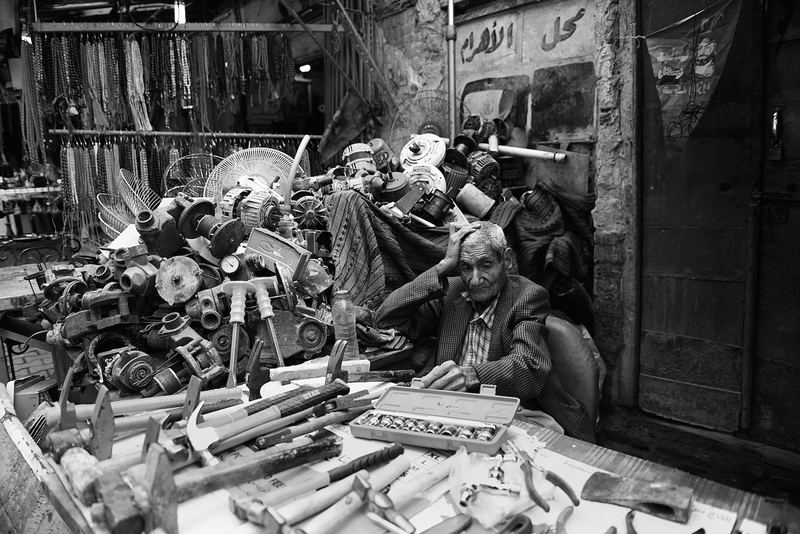 This month, Baghdad-based photographer Ayman Al Amiri will present his new work in an exhibition entitled Zuqaq (Alley) which consists of a short documentary film Zuqaq (2018) co-produced by Ruya, alongside a selection of black and white photographs of street life in Baghdad. From the series Zuqaq (2018). Courtesy of the artist. Zuqaq is a 14-minute biopic on Hadi Al Najar, a well known and established photographer in Iraq and President of the Society of Iraqi Photographers in Baghdad. Al Amiri explores Najar’s ambitious use of colour and the philosophical enquiry behind his photography work. Najar was active during the Iran-Iraq war and the embargo of the 1990s, and documented much of the devastation that occurred in southern Iraq in that time. Al Amiri speaks to the artist about his experiences of that time. The black and white photographs which accompany the film were taken by Al Amiri in the side streets of old Baghdad. They echo Najjar’s own work, documenting the Ottoman-era architecture of Baghdad crumbling historic districts, and the destitute and marginalized communities living there. The film and the photographs are an attempt to create a dialogue and bridge the gap between two generations of artists in Iraq. Zouqaq will be open from 13 July to 11 August, every Friday and Saturday from 10am-2pm at the Ruya Shop on Mutanabi Street, Baghdad.